Back in April we learned about the various pre-order bonuses to be included in Saint’s Row IV. Dubbed the Commander in Chief Edition, it brings with it a series of in-game rewards. But if that wasn’t enough to pique your interest, there’s now an official collector’s edition. 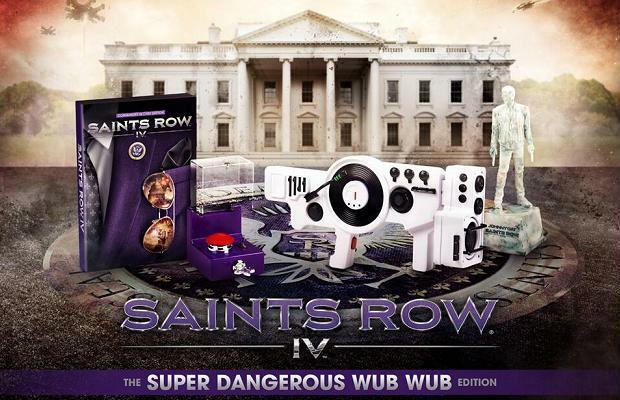 The absurdly named Super Dangerous Wub Wub Edition adds a few physical goods, but also brings with it a higher price tag. The bundle starts off with the Commander in Chief edition of Saint’s Row IV, which includes an alternate cover, the ‘Merica Weapon, Uncle Sam suit, and the Screaming Eagle Jet. Additionally, the Wub Wub Edition will come with a 12″ Dubstep Gun replica, Dubstep Doomsday Button, and an 8″ Johnny Gat Memorial Statue. All of these extra physical goods will run you $99 or £89.99. Saint’s Row IV is scheduled to hit North America August 20th, and the UK August 23rd. Look for it on the PC, 360, and PS3.